The quilting bug that is. It is something I've always wanted to try and I love it! I finished my very first block lastnight! 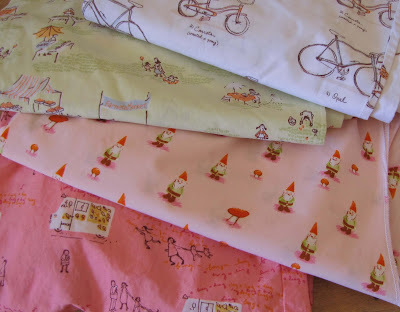 I've been collecting these Munki pj's that have the most adorable prints by Heather Ross. I think they are great for quilting and I'm really looking forward to using them. You can read more about the Munki obsession here. I went looking for this lastnight. I found it at a yard sale years ago. It is the beginning of a quilt and looks like the squares are made from vintage fabric. For years I've been trying to figure out what to do with it. I think I'll be taking it apart and using the pieces for a future quilt! Two of my favorite prints!